Facebook has rolled out new and Star Trek-related Reactions, but that’s far from the extent of its largesse (or monitoring of your Facebook activity). The social-media platform already plays virtual host to groups that organize the purchase, sale, and trade of items like clothes and furniture. But Facebook’s just streamlined the experience, while putting its users in touch with more buyers and sellers than ever. Today the company’s launched Marketplace, which is just want it sounds like and is available via the Facebook app. Items are sorted into categories that are titled, intuitively enough, things like Household, Apparel, and Electronics. You can narrow your search by price and category; you can also keep your search local with the built-in location tool, or search a separate city/town. Images, product descriptions, and the seller’s profile photo and name are all made available to prospective buyers. Once you decide you do want that mid-century vanity, you just message the seller and then work out the payment and shipping/pickup details. Facebook has no further hand in the transaction, so you’ll have to work out Paypal payments for yourselves. But the app does keep track of your shopping/selling history. Marketplace is currently available to Facebook users 18 or older (on iPhone or Android) in the U.S., U.K., Australia, and New Zealand. 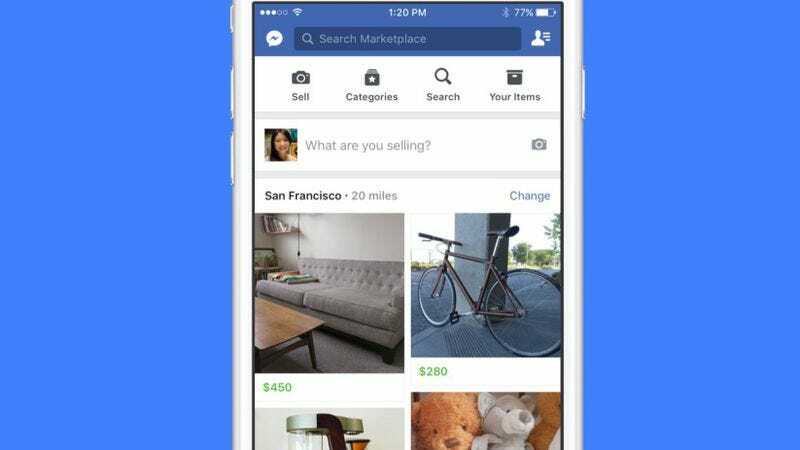 That’s not yet as extensive a reach as eBay’s (30 countries) or Craigslist’s (70 countries), but Facebook will start rolling Marketplace out to other countries in the coming months, as well as launch a desktop version. But if and when Facebook loops in some third-party payment processor, it’ll present some serious competition.